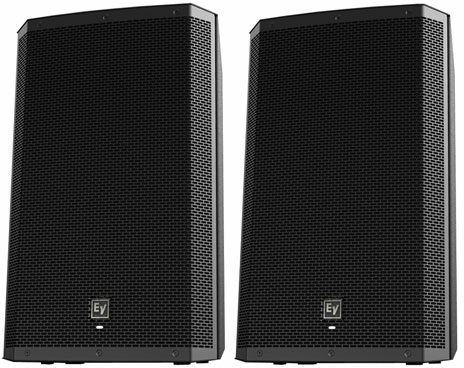 The Electro-Voice ZLX15P Powered Loudspeaker allows you to extend your low-end when used alone, but when paired with a Live X Sub, the ZLX15P provides crisp, clean highs and tight, deep lows for larger sized venues. Give your productions all the headroom they need for an incredible performance that comes across Loud and Clear! The powered ZLX models cut through the competition with the most complete and innovative package of features in their class - all of which work together to make it quicker and easier than ever to take control of your sound, whatever the show. With ZLX, Electro-Voice set out with a singular goal: to deliver best-in-class performance across every detail. ZLX combines decades of proven pro-audio engineering know-how with a bold look and user-friendly features that give you an extraordinary amount of control over your sound -- all with the renowned EV quality and reliability the pros trust. Sound: I have used these speakers in a small 20x30 room all the way to a 100x200 room and they fill the room nicely. They have very good low end, even without the subs, but run the sub and you can drive this thing till your ears ring! Highs are clean, Well it's all Clean the only thing that gets tough is over driving them with the low end up too high. It starts to clip and well run really hot. Keep the limit light off and run it for hours and everything will be great! Feature: Well for the 500 each what can I say. It's not a wooden case but it also doesn't cost as much or weigh as much! The Grill looks great, they're steel and tough but the little LED on the front should have been like it's big brother the ELX with the illuminated logo. That would have made a great addition! Ease of Use: Perfect plug and play! Just adjust the volume and let her rip! Quality: Over 100 hours of playing and most being right at the limit with no rattles or over heating, I have seen people with speakers that wouldn't make an hour at the limit! (not meaning QSC or Mackie I'm talking lower end) Value: In this case I was blown away by the product I got for the money I paid! Great job EV Manufacturer Support: I have not contacted them and hope to keep it that way! The Wow Factor: They have a nice clean look that blends nicely in every situation. You can even turn off all the LEDs on the front if you need to. I bought them because I needed speakers and these looked great, Sounded Great and were way below my budget for mains! Overall: I replaced some pretty cheap speakers with these and I don't have to say they sound better but I will. I heard these at Guitar Center next to the Mackie SRM450 and the QSC KW152s and I have to say the sound from these was better than the Mackie (at least to my ears) and it was no where close to 700 worse than the QSC speakers. The QSC didn't have as much punch on the low end (running subs really makes this unimportant) but was a bit clearer. The horn spread was a little wider all around. Considering the price of two of these was still 200 less than one QSC speaker The little bit of high end spread I'll live without and most crowds won't hear it anyways. All around I have put over 100 hours on these speakers (with 1 ELX118P) over the last few weeks that I've had them. Running them for hours on end right at the limit light threshold and no over heating or cutouts! Great cost effective speakers. 145 of 146 people (99.32%) found this review helpful. Did you? Overall: Here's my honest opinion on the ZLX-15P speakers..... I thoroughly impressed. My background has never been active/powered speakers. I'm from the old school of toting creates or records, amp racks, and passive over-sized speakers, along with horn cabs. So I've been traveling heavy since my teen years around 1986. Even when I had light gigs booked. So after converting 1000's of records to digital for laptop software and digital turntables, I became more open-minded to doing things easier. These speakers are my very first active set. I just got them today from zZounds...and whoa! I've been rocking them for 3 hours straight and absolutely love them! I can pick both of them up with each arm without eating spinach lie Popeye! Jokes aside, I now know I can be set-up in 20 minutes for small to medium gigs! No loading my enclosed trailer with bulky speakers and amp racks. All I need is the ZLX's, speaker stands, and turntable coffin. All of which can fit in my SUV. As far as sound, I'll only be repeating what everyone else has said, but I cosign with everyone who said these speakers are a good bang for the bucks they cost. I have plenty of subs and back-up power to reinforce the ZLX's when the need arises. However, I can get away just using the EV's during many venues & events. For the bigger venues, I plan to use the ZLX's on stands as my speakers for talking to the crowd, while using my other speakers for music only! Either way, these new speakers are easy to set up....it's plug & play all the way....all day! Last, but not least..... the easy payment was the sweet-spot on this deal! Free shipping and quick delivery was the icing for sure! Long story shorter... this are some nice speakers to add to any set-up! ~Nuff-Said! Style of Music: All types....all genres.